SKU: KING COBRA S2U. Categories: Aerospace, Military, Military, Computers, Rackmount Computers, GMS. The S2U “King Cobra” is a major breakthrough in server technology. It is the smallest, fastest rack-mount server on the market, with more I/O performance and storage functionality than any other server. It replaces several 1U/2U servers, switches/routers, RAID controllers, and Auxiliary Power Units (APU) with a single 2U, 17-inch deep (short) rack-mountable (or freestanding) enclosure. Furthermore, 100% of the “King Cobra” electronics modules are Line Replaceable Units (LRU) specifically designed for field replacement and upgrading. This at-the-module 100% LRU functionality allows the user to replace any function of the system in the field within seconds, thus providing ultimate flexibility and minimizing down time. The King Cobra S2U features state-of-the-art CPU, packaging, and cooling design, utilizing the rugged and proven OpenVPX (VITA 65) architecture. Unlike PC motherboards, which virtually all servers use, the “King Cobra” OpenVPX design can withstand much higher shock, vibration, and temperatures than standard servers. The “King Cobra” utilizes a modular subsystem design allowing the OEM user to upgrade or change the server’s configuration in the field quickly and economically. This reliable, field-proven OpenVPX architecture also takes full advantage of commercial-off-the shelf (COTS) PCI Express (PCIe) boards such as ultra-high-performance video boards, RAID controllers, GPGPU compute engines, and DSP modules, which may be quickly and easily plugged/unplugged into the system within seconds. OpenVPX is also used for the redundant, N+1 hot-swappable power supply modules. The CPU Module is a dual slot OpenVPX module with front and rear I/O. Using Intel’s latest server processor, the CPU module supports dual Intel® Xeon® processors (E5-2695 v4), each with up to 18 physical cores with Hyper-Threading for a total of 72 logical cores operating at up to 2.1GHz with the ability to TurboBoost up to 3.3GHz. To harvest this incredible CPU performance, each CPU is coupled with up to 512GB (1024GB total) of RAM organized in four banks. Each RAM bank consists of two DIMM arrays with Error Correcting Code (ECC). The ECC RAM provides 2-bit error detection with 1-bit of correction, and supports up to 2133 Mega Transfers per Second (MTS) between CPU and memory, resulting in an incredible peak memory transfer rate of over 80GB/s. The CPU module also provides two 10Gigabit Ethernet ports via SPF+ connectors for Fiber or Copper support. Additionally, two Gigabit Ethernet ports, four USB 3.0 ports, and one HDMI video port are provided on the CPU module’s front panel. For custom I/O, the SBC provides one XMC site with x8 PCIe with front and rear panel I/O, or a 2.5-inch Enterprise class SSD device that is removable from the front with up to 2.4GB/s read and 1.2GB/s write speeds. The SBC provides two Special Application Module (SAM™) sites, which support two mSATA SSD devices that may be used to boot the Operating System (OS) with RAID functions. Additional SAM I/O devices such as GPS, MIL-STD-1553, CANBus, or other ExpressMini cards may be used as well. Other I/O functions of the CPU module include: Baseboard Management Controller (BMC) for health monitoring and reporting via a dedicated Ethernet port, Trusted Platform Module (TPM), eight GPI/O lines, 16MB BIOS Flash, 2Kb of Field Replacement Unit (FRU) for configuration data, Real Time Clock (RTC) with field replaceable battery, and voltage/temperature monitoring. A 144×16 pixel LCD display with Up/Down, Left/Right keypad is accessible on front panel to provide the status of the CPU module and user parameters. The CPU module also provides an incredible 80 lanes of PCIe Gen 3 support for I/O expansion via its VPX P1-P5. The COM Module is a 6U single slot OpenVPX module. It is connected to the CPU module via a x4 PCIe lane via VPX-P1. The COM module provides twenty Gigabit ports via a managed switch with Power Over Ethernet+ (POE+), and two SAM™ I/O sites for additional functions such as Wi-Fi, Cellular, Bluetooth and GPS. The switch functions are controlled via a 416MHz MIPS processor with 128MB of DRAM. The MIPS processor controls up to twenty Gigabit Ethernet ports and two 10Gigabit Ethernet ports. The two 10Gigabit Ethernet ports are connected via SFP+ connectors to the COM module’s front panel, and support Fiber/Copper interfaces, which may connect directly to the CPU module’s 10Gigabit Ethernet port. The managed switch supports Layer 2 and Layer 3 functions such as VLAN and QoS processing, enabling the delivery of differentiated services, security via intelligent frame processing, and egress frame manipulation. The switch may be configured via the host CPU USB/COM port that is connected internally or via a Gigabit Ethernet port on the rear panel. All twenty Gigabit Ethernet ports support POE+, which can provide up to 25W on each port up to 150W total. The COM module supports a full-featured Cisco® IOS® software package with Mobile Ready Net to facilitate the most complex routing needs for security and compatibility with existing defense infrastructures. The Router is designed for battlefield applications and includes features to create and maintain both stationary and ad hoc networks with the highest quality-of-service (QoS). Moreover, it can adjust QoS based upon available bandwidth, resources, and available networks. The Router provides Radio Aware Routing (RAR), Dynamic Link Exchange Protocol (DLEP), and IPv6. It supports routing protocols RIP (V1/V2), OSPF, EIGRP-IP, BGP and more, plus it supports up to 32 VLANs. Data packet encapsulations include PPP, PPPoE, GRE and 802.1q VLAN trunking. The Router module portion of the COM Subsystem is based on a Quad Core Intel® Atom™ processor with 4GB of RAM and four Gigabit Ethernet ports. The COM module also provides one additional SAM™ I/O site for more I/O such as Wi-Fi, or GPS for time stamping of each data packet. King Cobra S2U is the world’s most advanced server system. Besides offering more than 8U worth of server/switch/router/storage functionality in only 2U of (short) rack space, S2U’s field-replaceable, modular architecture is an industry breakthrough at a significantly lower price. Where every server on the planet except S2U relies on an inflexible bolted-in motherboard that is often happiest in an air-conditioned environment, S2U relies on the battle-hardened OpenVPX standard. S2U’s motherboard can be easily swapped out in the field, or upgraded as technology evolves. In addition to the CPU, every electronics module in the S2U “King Cobra” is a modular line replacement unit (LRU) and can be easily extracted, changed or replaced with a pre-planned product improvement. S2U’s rugged field replaceable modules maximize battlefield uptime and survivability, shattering the fallacy that commercial servers cannot be “ruggedized” for the battlefield. Typical motherboard-based servers can’t survive, they can’t be easily fixed, and they won’t evolve when your program needs change. King Cobra S2U’s modular approach has several other advantages when applied to long-running programs. Besides using modular LRUs for tech refresh on the original program, S2U can be easily adapted to other programs as well. Application software developed for one program can be reused, while new or legacy I/O modules from another program can be added to S2U. In this fashion, S2U remains the same basic system across multiple programs but is modified with different platform-specific configurations. This commonality eases system qualification and meets joint service requirements for “component” commonality across platforms. King Cobra S2U’s modular approach also simplifies sparing. A “spare” in S2U is any of the removable LRU electronics subsystem modules. With conventional servers, the lowest size LRU spare is usually the whole server itself. With S2U, spare electronics modules can be available at the depot level. The S2U modular approach saves money, simplifies logistics, and finally makes true field replacement a reality. Defense systems need to survive the battlefield as well as the design and budget cycles inherent in the military lifecycle. The GMS modular design approach allows the S2U server to upgrade and evolve as technology and programs change, such as from one processor generation to the next. King Cobra S2U’s electronics modules and firmware are easily upgradeable: a program requalification might not even be required. PCI EXPRESS FABRIC Interconnects all S2U modules. Provides maximum bandwidth with growth headroom for years to come. OPENVPX Battle-hardened modules used in rugged aviation, naval, vetronics and space platforms. No “practically-obsolete” commercial motherboards from offshore manufacturers are found in S2U. INDUSTRY-STANDARD SSD DRIVES Ubiquitous SATA and PCI Express drives are available in myriad densities and MTBF ratings. This future-proofs S2U as the industry evolves to PCI Express SSDs. PCIE CARD CAGE AND AUXILIARY POWER Commonly-available PCI Express (PCIe) computer boards plug right in. Or the modular card cage can be replaced with power supply/battery back-up for graceful shutdown in the event of power failure. Both options maximize flexibility and make S2U easy to design with—or design into legacy programs. OPENVPX POWER AND I/O MODULES A smaller version of S2U’s “motherboard” and communications modules, S2U relies on industry-standard power supply modules with wide availability and voltage choices. Power supply sparing becomes off-the-shelf. Add-in industry-standard 3U OpenVPX I/O and co-processor boards substantially extend “King Cobra” functionality. CISCO® MOBILE READYNET ROUTER The world’s most trusted router software in S2U assures interoperability with battlefield LANs and WANs. Software programmability protects attack surfaces as the cyber-threat grows, allowing S2U’s capabilities to grow with the network and cyber security needs. ADD-IN I/O OPTIONS S2U contains at least 20 different ways to add I/O and new functions to the server. Various modules are dual-use, can be swapped out for other functions, or are ready to accept new capabilities. No other server has this much flexibility…in such a small space. The Auxiliary Power Unit (APU) is designed to provide backup power to the “King Cobra” for several minutes in order to prevent sudden shutdown, which can create catastrophic system errors and corrupt the file system. The Power Supply/APU Subsystem detects power brownouts and failure conditions, and provides a clean DC power supply to the S2U while forcing an orderly shutdown. BIOS settings allow the system to go to suspend-to-disk mode (S4 state) or full shutdown (S5). The Power Supply/APU Subsystem may be ordered with a LiFePO4 type of battery for ground-based applications, or with Super Caps technology for airborne applications where batteries are prohibited. The Power Supply/APU supports 110/220 VAC or 28 VDC input power (MIL-STD-704F), supports voltage and temperature monitoring with reporting, and may be easily removed via locking ejectors. When the Power Supply/APU is used the PCIe subsystem is omitted from the “King Cobra” (they are mutually exclusive). The PCIe Subsystem provides four full length/full height PCIe slots for industry-standard add-on modules. Alternatively, the PCIe Subsystem can be swapped out for the Power Supply/Auxiliary Power Unit Subsystem. The Power Supply/Auxiliary Power Unit (APU) Subsystem provides normal and holdup power for the entire S2U. These two subsystems are installed independently. When the PCIe Subsystem option is used, power to “King Cobra” is supplied via the 3U OpenVPX Subsystem utilizing 3U OpenVPX power supplies. When the Power Supply/APU Subsystem is used, normal power is provided via this subsystem and backup power or orderly shutdown is provided via internal batteries or Super Caps. Besides providing backup power, choosing the Power Supply/APU in “King Cobra” makes available three slots in the 3U OpenVPX Subsystem to support user I/O modules. The PCIe Subsystem is a function never seen before in any server. It is a removable subsystem that houses up to four full size, full height PCIe cards such as video cards, RAID controllers, DSPs, and many other ultra-high performance cards requiring the fastest throughput possible. Each site supports a x16 PCIe interface and gives rear panel access directly to I/O. Up to 600W of total power is provided for these four sites, making them capable of supporting the most power demanding applications. Any standard PCI Express card with PCIe lane width up to x16 can be installed into the PCIe Subsystem. Examples include RAID controllers, FPGA co-processors, and graphics processors or GPGPU processors. For example, two NVIDIA GTX-980 graphics cards can be installed, each with up to 4.62 TFLOPS per GPU. Collectively, this gives S2U HPEC/HPC GPGPU performance up to 9.24 TFLOPS with 4,096 CUDA cores. Or, using NVIDIA’s new Pascal architecture, two P100 GPGPU compute engines can be installed turning S2U into a 24 TFLOPS supercomputer—in only 2U of space. The Power Supply/Auxiliary Power Unit (APU) is designed to provide holdup power to the “King Cobra” for several minutes in order to prevent sudden shutdown, which can create catastrophic system errors and corrupt the file system. The Power Supply/APU Subsystem detects power brownouts and failure conditions, and provides a clean DC power supply to the S2U while forcing an orderly shutdown. BIOS settings allow the system to go to suspend-to-disk mode (S4 state) or full shutdown (S5). The Storage/SAM™ Subsystem provides twelve removable drive bays. Each drive bay supports standard 2.5-inch SAS/SATA drives or the new upcoming Enterprise class NVMe SSD drives which utilize x4 PCIe for the highest performance possible. Each Enterprise Class x4 PCIe SSD supports up to 2.4GB/s read and 1.2GB/s write speeds and performance increases are noticeable. The SAS/SATA interface is provided by the CPU module directly or from the PCIe Subsystem via a RAID host controller.No SATA port multipliers are used, thus each port is capable of full SATA III speeds of up to 6 Gb/s, and supports RAID 0,1,5,10 and 50. These twelve sites also support the new SAM™ I/O modules from GMS plus the Mini-PCIe standard. Since each site has x4 PCIe lanes as well as SAS/SATA support, ultra-fast I/O devices such as dual HD video capture, DSP, FPGA, MIL-STD-1553, NTDS, ARINC-429 and other high-performance functions may be added. GMS will be supplying a variety of high-speed I/O modules to support a wide array of standard or custom functions. Cooling subsystem consists of two Fan Trays, each with six ultra-high-speed fans with programmable speed and a tachometer to verify fan operations. These high-speed fans are individually controlled via a microcontroller to deliver the optimum cooling for every section on the “King Cobra”. The S2U is designed to replace up to 8U of space in a rack mount card cage, and is ideal for applications requiring rugged servers with ultra high storage, CPU power with optional best graphics, or backup power for orderly shutdown. 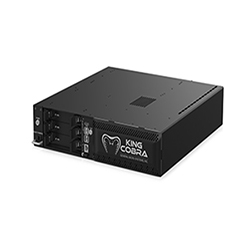 The King Cobra provides the highest SWaP efficiency in the server market while providing 100% LRU capability for minimum downtime, all while minimizing the needs for sparing servers. The S2U is targeted for applications where ruggedness, size, power, and serviceability are key factors, such as in airdrop, naval command centers and submarines. S2U “King Cobra” has unprecedented options for COTS add-in modules, including standards such as PCIe, OpenVPX, XMC and more. For example, two NVIDIA GTX-980 graphics cards can be installed, each with up to 4.62 TFLOPS per GPU. Collectively, this gives S2U HPEC/HPC GPGPU performance up to 9.24 TFLOPS with 4,096 CUDA cores. The King Cobra supports the most popular Hypervisors offered by VMware®, WindRiver® and Microsoft®, and may be shipped from the factory with operating systems such as Windows® and Linux® pre-installed. The S2U is fully compliant to MIL-STD 810G, MIL-STD-1275D, MIL-S-901D, DO-160D, MIL-STD-461E and IP54 standards. General Micro Systems (GMS) creates exceptionally innovative products, trusted and deployed through 35+ years of credibility, hundreds of defense, industrial and medical customers, and thousands of successfully deployed systems. 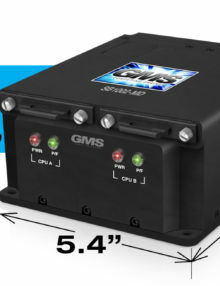 GMS systems are distinguished by their ultra-rugged designs and highest density compute and I/O performance per cubic inch. A trusted Intel® partner since 1986, GMS is the standard bearer in modular compute- intensive, highest I/O density, highest performance-per-volume, and rugged small form-factor embedded computing systems, servers, and switches. The majority of GMS products are fanless and conduction cooled. Designed from the ground up to provide the highest performance and functionality in the harshest environments on the planet, the company’s highly customizable products include GMS Rugged DNA™ with patented RuggedCool™ thermal cooling technology. 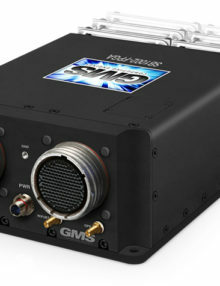 GMS systems are ideal for demanding C4ISR defense, aerospace, medical, industrial, and energy exploration applications. GMS is an IEC, AS9100, and MIL-SPEC supplier with infrastructure and operations for long-life, spec-controlled, and configuration-managed programs. Our Quality Manual, certifications, and further documentation about our rugged infrastructure is available upon request. The SB1002-LP "Hummingbird" is a fifth-generation, ultra-rugged, small, lightweight computer system. It is designed to provide a DZUS™ rail mounts, low profile, with optional high speed I/O, and with removable drive, while providing the highest level of workstation performance possible in a fully ruggedized, conduction-cooled, sealed system, operating from -40°C to +85°C (-20°C to +75°C standard). This system is designed for applications that require a small, ultra-rugged enclosure with the highest possible performance, per dollar and per watt, while utilizing rugged interconnects to provide a fully sealed system. The SB1002-FPGA "Hawk" is a fifth-generation, ultra-rugged, small, lightweight FPGA computer system. It is designed to support high gate-count Xilinix® or Altera® Field Programmable Gate Array (FPGA) devices for custom ultra-high-speed computing functions, while providing the highest level of workstation performance possible in a fully ruggedized, conduction-cooled, sealed system, operating from -40°C to +85°C (-20°C to +75°C standard). This system is designed for applications requiring ultra-high-speed data processing and I/O, such as FPDP, DSP, and many other custom functions that require a small, ultra-rugged enclosure with the highest possible performance per dollar and per watt while utilizing rugged interconnects to provide a fully sealed system. 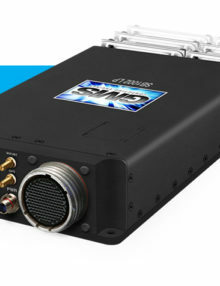 The SB1002-HDVR “Eagle” is a fifth-generation, ultra-rugged, small, lightweight HD-DVR computer system. It is designed to record up to four HD video ports simultaneously at 1080P/30Hz with audio, simultaneously record and monitor/playback over LAN, and support H.264 compression on all four channels and metadata processing through Texas Instruments' DaVinci DSP, offering real time encoding and decoding capabilities. The "Eagle" provides the highest level of workstation performance possible in a fully ruggedized, conduction-cooled, sealed system, operating up to -40°C to +85°C (-20°C to +75°C standard). This system is designed for applications that require a small, ultra-rugged enclosure with the highest possible performance, per dollar and per watt, while utilizing rugged interconnects to provide a fully sealed system. The SB1002-MD “Golden-Eyes” is a fifth-generation, ultra-rugged, small, lightweight computer system. It is designed to allow two different domains (red and black) to operate independently in the same system, while providing the highest level of workstation performance possible in a fully ruggedized, conduction-cooled, sealed system, operating up to -40°C to +85°C (-20°C to +75°C standard). The Golden-Eyes system is targeted for applications where classified and unclassified software need to operate simultaneously with an NSA-approved architecture for multi-domain applications in a small, ultra-rugged enclosure with the highest possible performance, per dollar and per watt, while utilizing rugged interconnects to provide a fully sealed system and sharing only DC power. The Golden-Eyes supports the latest, most power-efficient Intel® Core™ i7 Haswell processor with Hyper-Threading for a total of 8 logical cores, each operating at up to 2.4GHz and the ability to TurboBoost up to 3.4GHz. To harvest this incredible CPU performance, the CPU is coupled with up to 32GB of RAM organized in two banks that support Error Correcting Code (ECC). The ECC RAM provides 2-bit error detection and 1-bit error correction and supports up to 1600 Mega Transfers per Second (MTS) between CPU and memory.